Sorry you couldn’t get into it. I gave it a 3-star (“OK”) rating (out of 5), which means I can recommend it, but didn’t consider it “Good” or “Great.” I must not have been finished with it if I recommended it, because I don’t usually recommend books by name unless I’ve given them 4 or 5 stars. Egan’s The Worse Hard Time was much better–better book organization and writing. I thought this one was disorganized, but I was interested in the parts about the start of the National Forest Service, and learning who Gifford PInchot was, since we live near the GPNF. I have learned from being in my book club that many books I give a 3-star rating to are rated higher by other folks. Huh, interesting, I am glad you weren’t offended by me giving your recommendation a single heart. I think rating the books — which we don’t do in our book club, but only in my blog — makes me harder on the book. More discerning, perhaps? I like to think so! And I gave it a 4 on a scale of 1-5. 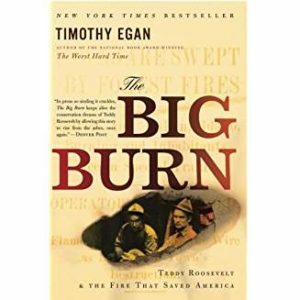 I so appreciate Timothy Egan’s research on topics that are an integral part of our history. I never would have known about how the idea of public lands came about along with the Forest Service and the Pulaski tool. I’m not one for history books, but this and The Worst Hard Time had me there with the characters. I tried this book when it first came out. As I recall, I skimmed and skipped parts which means I didn’t really finish it. This is a great story but this treatment didn’t make it.